Are you sharing your gifts with the world? - Am I Hungry?Am I Hungry? I had the incredible opportunity to see Elton John last night on his “Farewell Yellow Brick Road” tour. This was a bit nostalgic for me because my first concert (without parents) was Elton John in 1975 for $7.50! My ticket price had increased by 4250%, but for a lifelong fan, it was worth every penny. 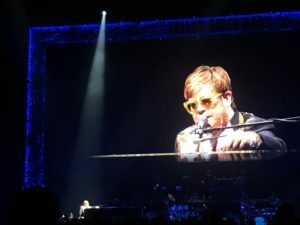 It was an amazing event, causing me to reflect on how Elton John somehow discovered his gifts, overcame a number of personal challenges, and brought so much joy into the world. He also talked about his 50 years in the business and shared some of his accomplishments beyond his music, like his work for AIDS and his beautiful family. I don’t know anything about Elton’s body image, but what I observed was a person who was sharing his gifts fully with the world, not letting fear of judgment in an industry that rewards youth and cultural definitions of beauty get in his way. Granted, he receives a huge financial pay off for still putting himself out there, but my guess is that he doesn’t need more money. He simply seems to love what he does and we loved being part of it. So that led to another thought… Are you allowing fear of judgment about your age, your size, or anything else stand in your way of discovering and sharing your gifts and living your life fully? Are you postponing something you want to do until you somehow transform into a different person? Could you be depriving the world of your unique beauty, talents, and experiences? There will only be one Elton John. And there is only one you. Thanks to you, I am doing so much better and am beginning to want to eat healthy things and am rejecting the crazy food I craved. I have not lost any weight that I know of but I am thrilled that I’m having these healthy desires. I am a therapist and want to help others in group counseling find the keys to losing weight. I have also always wanted to write a screen play but have never done it before. I think my fears about many things are holding me back. I am so excited for your renewed passion for writing your screen play! Dina, I’d really like to encourage you to shift your focus (for yourself and your clients) from weight to well-being. A weight-centered focus keeps us outwardly- and future-focused. Mindful eating is an inward focus that keeps us grounded in the present moment – the only moment where we can make decisions and live our big, vibrant lives!